GAITHERSBURG, MD--Professional Products, Inc. recently installed a Video Replay System for the new 15,000-capacity John Paul Jones Multipurpose Arena at the University of Virginia. The arena will be used primarily for basketball games, but will also host non-sports activities such as concerts and graduation ceremonies. In the control room of UVA's John Paul Jones Multipurpose Arena, a Ross Synergy 3 digital production switcher was installed to control the servers and decks, and an Evertz VIP Series Virtual Wall system is in place for monitoring, utilizing Clarity Baycat LCD screens. According to Kevin Filano, systems design engineer for PPI, the most challenging part of the project didn't have anything to do with equipment (installation was remarkably smooth) but with building around new construction. His biggest piece of advice is about scheduling. "Make sure the room is done before you put your equipment in," said Filano. "We usually come in after the fact. We might do cable pulls ahead of time, but to actually install different control rooms and stuff, we like to do it after construction is done." Interestingly, the project is also expected to change the area around the school for the better by bringing in larger acts than usually hit the town, ranging from pro wrestling to Cirque du Soleil. The first event scheduled to take place in the arena is a Dave Matthews Band concert. Working from a design created in conjunction with the Dallas-based consulting group Wrightson, Johnson, Haddon & Williams, as well as people from the University, PPI installed a system from Dixon Sports Computing for replays, commercials and general information. The video system in the arena consists of six 8.5- by 16-foot boards with 10mm LEDs, arranged with four in a center cluster and two in the lobby. The system demanded three 16:9 switchable cameras with triax hookups with standard video and audio. For displaying stats and bios on replays, PPI opted for Avid Flash Pinnacle character generation. For commercials, bugs, and various other prerecorded materials, they chose an Image Server 2000 from 360 Systems and a Grass Valley Turbo intelligent digital disk recorder. 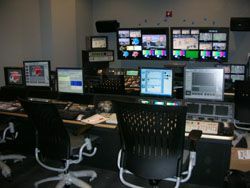 In the control room, a Ross Synergy 3 digital production switcher was installed to control the servers and decks, and an Evertz VIP Series Virtual Wall system is in place for monitoring, utilizing Clarity Baycat LCD screens. Another upcoming aspect of the project, according to Filano, is that eventually the school plans to use the John Paul Jones Arena's master control for three different venues, hosting football, soccer, baseball, and basketball. The video boards in each venue will be connected via fiber cables.